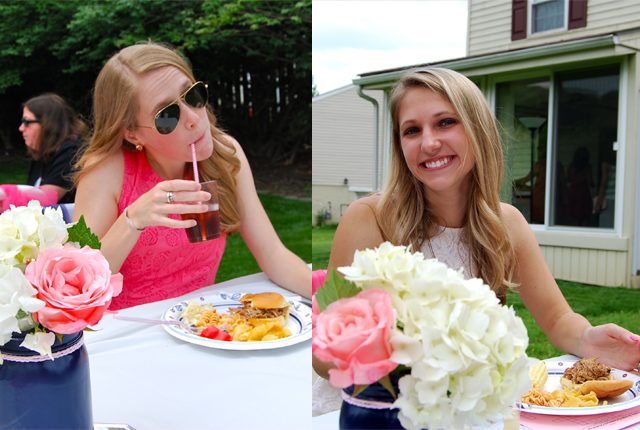 Sunday, along with the other bridesmaids, we hosted a bridal shower for my roommate. It was so fun to see it all come together and to be able to shower our sweet friend in love and prezzies. 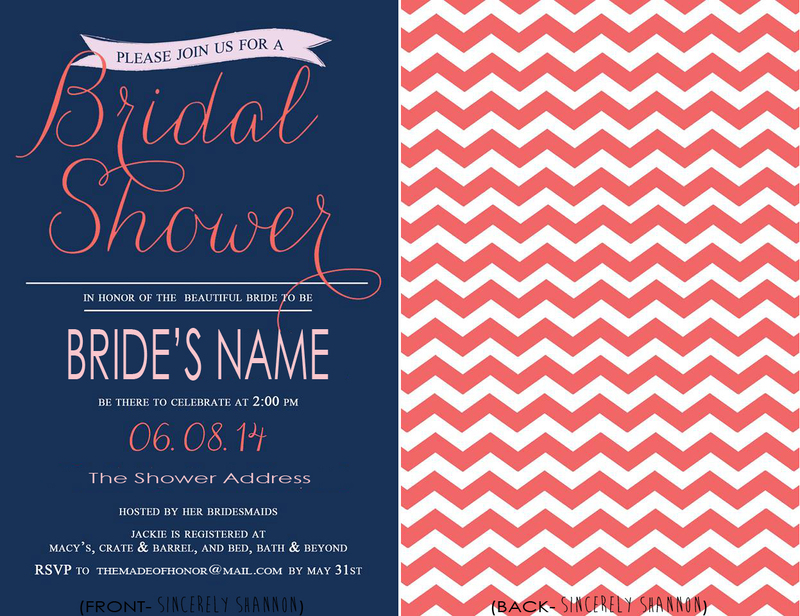 I volunteered to design the invite and all the little personal stationary and decorative touches for the shower. I left the cooking to the other girls and went to town with a coral and navy color scheme, with touches of chevron. Above is the invite we sent out (obviously with the personal information that I've left off here). Along with the colors the theme was carried through with Something Old, Something New and Something Borrowed tables and each table had chevron bunting that coordinated with the invite. At the "Something Old" table we displayed pictures of Jackie growing up, with her family and fellow bridesmaids. We also set up a little station where guests could write advice or a little note for the bride to be. The top of the note cards said "...to the future Mrs. 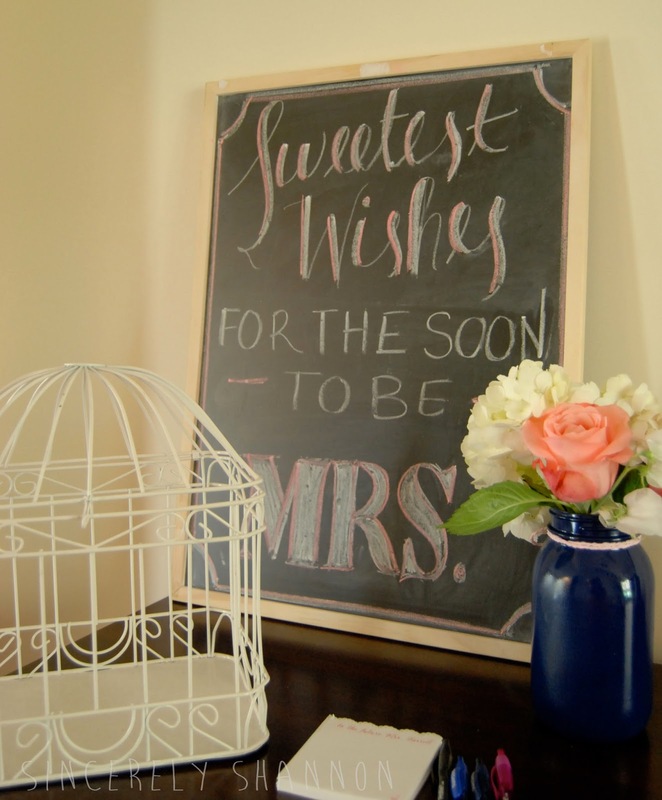 Her New Name" and on the chalkboard signage I wrote "Sweetest wishes for the soon to be Mrs."
At the "Something Borrowed" table we set up a recipe book for guests to add their favorite recipes. (We had sent out recipe cards with the invitations.) And at the "Something New" table we displayed all her gorgeous gifts under the bunting. Before we dove into the gifts, we tucked into all the beautiful foods that the other bridesmaids had prepared. Pulled pork, potato salad, homemade bruschetta, guacamole, just to name a few of the yummy dishes we enjoyed. Pink table cloths, fluffy hydrangeas and mason jars made for pretty tablescapes. 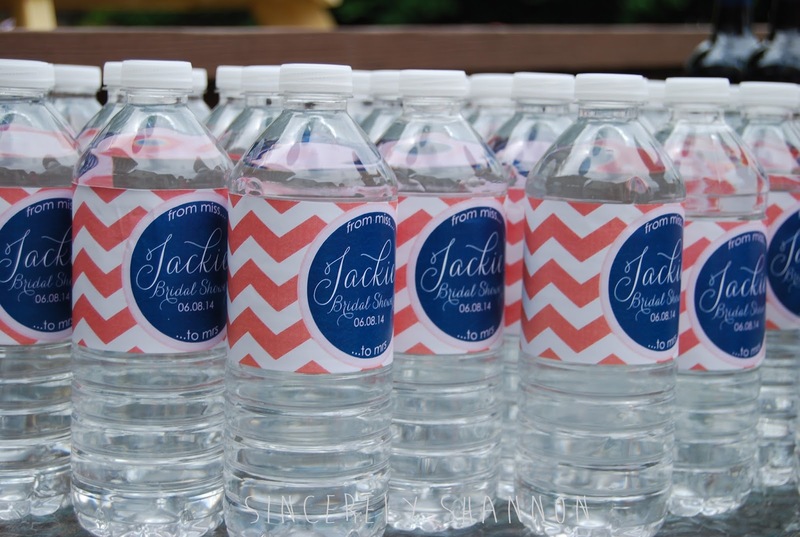 I hoped that no one was sick of the chevron yet because I couldn't help myself with coordinating water bottle labels. 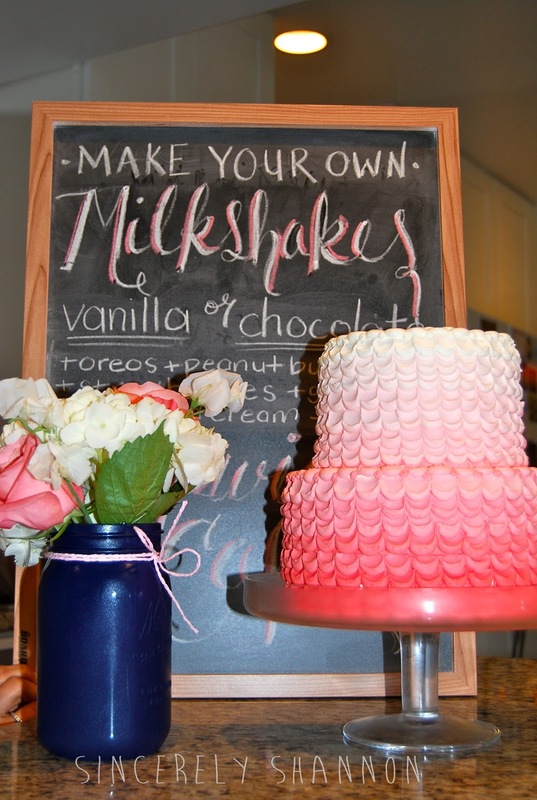 I also made a second chalkboard for the dessert table which I was pretty pleased with. One of the bridesmaids made the most beautiful ombre cake I have ever seen. It was almost too pretty to eat and it went perfectly with all our other decorations! 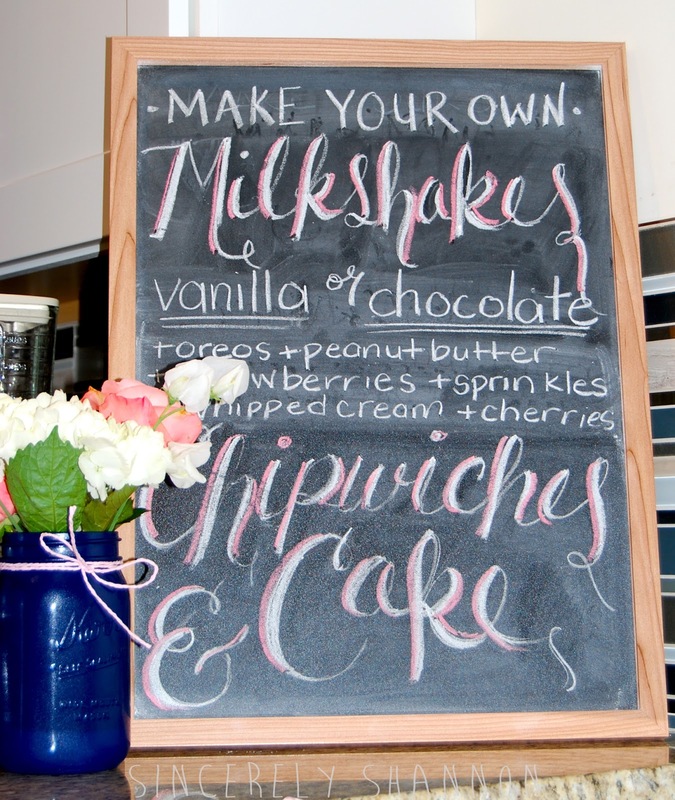 We also had a milkshake bar and ice cream chipwiches. It was a lot of work coordinating everything with 7 bridesmaids but I love how it all came together. It was also a great chance to get to meet her childhood friends and more of her family. But the biggest sign of a good shower is that the bride was properly loved and spoiled! So I'd call this a huge success! Only 3 more months until her big day- I can't wait! **p.s if you're interested in invitations, menu cards, water bottle labels, or other fun supplies for your own parties, check out my design page and we can chat. I love everything about this! So precious! Your dress= awesome! Thanks so much! It's my go-to shower dress since I feel all 1950's housewifey in it. I agree with Claire on your dress!! The shower decorations = priceless!! And wow to all that yummy looking food. You are right about the love for your friend and bride-to-be. All you really need is love!! Everything turned out so cute! I'm glad the bride had a happy day! I was just going to say almost exactly what your mom said, until I looked up and saw her comment! You did an amazing job!!! Love the colors and the chevron! Beautiful party - and really yummy looking food! Well done.